Is Market Research Protected from the “Robots”? The rise of machine learning is hard to ignore. It’s happening fast. For the vast majority of digital marketers and forward-thinking companies, it’s an exciting time. However, there are some concerns over the big picture. As more companies adopt automated market research and AI, what does the future really look like for business? Moreover, how will it affect the people doing those jobs today? The reality is, we can all gain a lot from embracing automation. We at E29 have been working with a number of automated market research technology providers for some time now. ZappiStore is one such provider that we’ve had tremendous success with. Together, we’ve sought to improve the results of concept testing for a number of our less established clients who have significant innovations looming, but whose timelines to market are tight. With automated market research in play, we’ve been able to aid them in making key decisions, often in less than a week. One of the most widespread uses of automation in market research is in data analytics. Companies can track users onsite behaviors to gain deep insights into the needs and interests of their audience. This enables ecommerce companies to tailor brand messaging and offer targeted product recommendations that get more engagement, and ultimately, more conversions. With online surveys, your business can curate a global audience of tens of thousands, either in targeted locations or spread across the world. Automation is typically cheaper than traditional marketing methods. With fewer overheads, automated market research reaps a higher ROI on spend. Research indicates that 93% of people view AI as a huge opportunity, while 7% consider it to be a threat, as many believe AI will be doing their job better than them within the next 10 years. The buzz around machine learning and digital transformative technologies is understandable, however, it’s important to keep it in perspective. On its own, automation technology still lacks a degree of sophistication. It is only when humans perform deeper analysis on data that the value of the research can be measured. Take, for example, the instance of an automated survey or interview. Sure, you can garner a wealth of information from numerous participants in a short space of time. However, automation alone is not yet at a point where it can probe or clarify points beyond the basic insights. Without a human present, creative thought is absent. There’s no doubt that automated tools do enhance our ability to conduct qualitative analysis, which in turn gives marketers the power to improve their campaigns. That being said, machines aren’t able to connect the dots without us – yet. The people with the biggest concerns about the dawn of a new era in digital marketing are those who are currently working in market research. Given that machine learning is already faster, more accurate, and more organized with data than any human could ever dream of, it’s easy to understand why some people are fearing for their jobs. But they shouldn’t consider this with a doom-and-gloom outlook. Instead, we should look to adapt and find new opportunities alongside automation. Many people are already doing that, with 50% of people considering upskilling. Others are finding new roles where they can use automation in their job, rather than be supplanted by it. For now, automation in market research is an innovative strategy that all businesses can leverage and profit from. But it cannot fulfill its potential without humans. Learning how to work with these new technologies will set people and businesses up for a prosperous future. 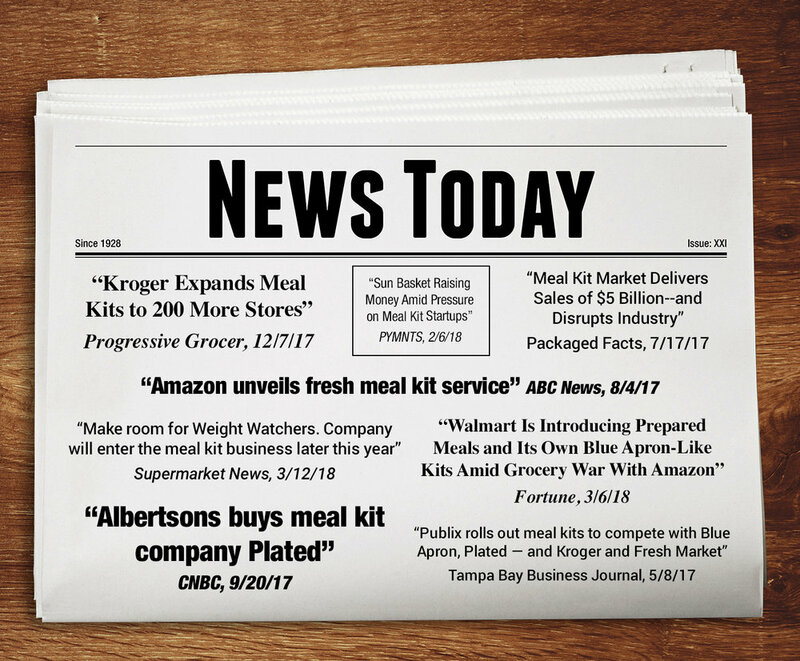 Over the past few years you may have noticed the number of headlines touting the latest entrants into the meal kits business; from retailers such as Walmart and Amazon, to manufactures like Weight Watchers and online subscription services such as Terra’s Kitchen. It seems everyone wants a piece of the $5 billion (and growing) meal kits market; an industry pioneered in the US in 2012 by Blue Apron, Hello Fresh and Plated. Also known as computer vision, image recognition refers to the ability of a computer to “see” or translate the information fed to it from an image (still, video, graphic or even live). Example: At CES this year Yummly and Whirlpool introduced an app that can scan the items you have on hand then recommend recipes based on what is often a mishmash of ingredients. Consideration: Who needs a meal kit to inspire unique and tasty creations? Currently only legal in five states (Virginia, Idaho, Wisconsin, Florida and Ohio), delivery robots are small, electric-powered ground rovers equipped with a number sensors that allow them to navigate sidewalks at pedestrian speeds (4 mph). They can make one small delivery at a time, in about 20 minutes from the time an order is placed, and are believed by many to be revolutionary to last-mile delivery fulfillment. Example: Starship Technologies began testing delivery bots in Washington D.C. about one year ago with on-demand delivery service Postmates. The city only allowed five total bots to be used at any given time during what was the pilot of the PDD program (Personal Delivery Device). To date, the bots have made over 7,000 deliveries, with just three collisions (all of which were deemed to be the fault of drivers that did not yield to the “pedestrian” bots), and D.C. is extending the program. Consideration: If you have a craving to slurp ramen tonight, you can get it from your favorite noodle parlor or convenience store in under a half hour, without leaving the house. Why worry about having the time or desire to make the Bacon and Honey Mustard Glazed Chicken with Broccolini Radish and Wheatberry that’s waiting in your fridge. Smart locks allow keyless entry into your home, while cloud cams are basically security cameras. Linking of the two technologies enables monitored in-home delivery. Example: In addition to allowing an Amazon Fresh delivery driver access into your home to put all of the perishables that were ordered into the refrigerator/freezer, Amazon Key is integrating with over 1,200 service providers, like in-home chefs, to grant them access as well. Consideration: Why let someone else determine what you’re going to eat? Like in a restaurant, you decide, and let that someone else do the planning and prep. A 3D food printer works like a regular 3D printer with one primary exception – the printer uses food instead plastic. And the benefits are numerous: personalized and precise nutrition; unusual food composition; unique designs and textures; easy food prep; novelty; etc. Example: Natural Machines, makers of the Foodini, advertise the printer as a “new generation kitchen appliance that combines technology, food, art and design… manage the difficult and time-consuming parts of food preparation that often discourage people from creating homemade food.” The Foodini is currently only available direct from the manufacturer. Consideration: Even if 3D food printing turns out to be time consuming and expensive, the social clout gained has got to be greater than that to be had in perfecting Pork Florentine with Grains and Zucchini. What are your thoughts? Could any of these technologies curtail the demand for meal kits? Or could one or more aid in stimulating the industry’s growth even further? Grocery shopping definitely isn’t what it used to be. When I was a kid in the early 80’s, my mother would toss my brother and I into our family minivan and we’d drive to our local grocery store for the weekly stock-up trip. She would have her coupons and ads in hand, ready to save and take advantage of weekly sales. She usually shopped on auto-pilot and rarely veered from the list. She was budget conscious yet brand loyal. She purchased many of the brands my grandmother used because they were trusted, familiar and nostalgic. I never noticed her (or any other shoppers around us, for that matter) paying especially close attention to things like package labels, ingredients, colorings or additives. And when she would make her way to the checkout line, my mother would pay by writing a paper check made out to the supermarket, finally recording it in her balance ledger before we left. Maybe, if my brother and I were well behaved, we earned a gumball from the machine on our way out. As much as I don’t like to date myself, this sounds pretty antiquated – doesn’t it? The landscape of grocery shopping has evolved by leaps and bounds since I was a child. It goes without saying that the “pay-by-paper-check” times are (mostly) behind us, and that no checkout line is equipped without a credit card machine, most recently with a chip reader. Today’s grocery stores also have express checkout lines for shoppers popping in for a quick trip, reinforcing that shopping behaviors extend beyond the weekly stock up trip. Consumer habits have changed. I now walk the grocery aisles with my own children in tow (but no family minivan yet) and the brands are shouting at us from the shelves, begging for consideration to try or switch or save. Words and trends like superfood, organic, antioxidants, non GMO, gluten free, probiotics, Whole 30 and vegan are seen on product packaging and shelf signage throughout the store. Brands now promote sweepstakes, partnerships or exclusive offers, asking shoppers to scan a code or go online. Consider the fact that in the mid ‘70’s, the typical grocery store featured less than 9,000 products. Today, that number is closer to 45,000 different items. There are more brand choices (and brand messages) than ever. Or you know what? Modern times allow us to skip the long (or express) checkout all together. Many retailers are now embracing online grocery shopping, including grocery giants like Whole Foods and Walmart. Recent studies show that about 23% of American households are now choosing and buying their groceries online, according to a 2017 study by the Food Marketing Institute and Nielsen. Still, many shoppers are resistant to such tech-savvy buying patterns simply because of their desire to see, touch and engage with the product or brand in-person – especially when it comes to produce or meat products. And what would modern times be without Amazon swooping in to save the day by delivering a unique solution for long checkout lines with their Amazon Go “Just Walk Out” technology. The retail evolution over the past 3 decades is astounding. As I reflect back on my mother’s grocery trips and how different my shopper buying patterns are, I can’t help but wonder if those were simpler times. Shoppers today have many more options and much more at their fingertips, including the click of a digital button to endless product options to skipping the checkout line all together. While more convenient, with that comes a sometimes-dizzying world filled with multiple options, brand messages and buzzwords across categories. How does a brand or product break through the clutter? We’ll save that for the next episode. The speed at which our world is ever-changing is lightning fast. As the modern shopper’s buying behaviors, mindsets and purchase patterns quickly evolve, I feel it’s imperative to not only understand, but also adapt to this fast-paced evolution. With the busy life I lead, there’s no question that I am the definition of today’s modern shopper. But what exactly does that mean? It means I shop around the clock. I want to be in control. I shop and share across multiple channels, from e-commerce to brick-and-mortar to social media. And when I want something, I know just how to get it. After perusing their website for the highly coveted Jimmy Choo perfect heel, I found myself on the E! News Fashion page where I was served an ad for the shoes I’d been admiring. 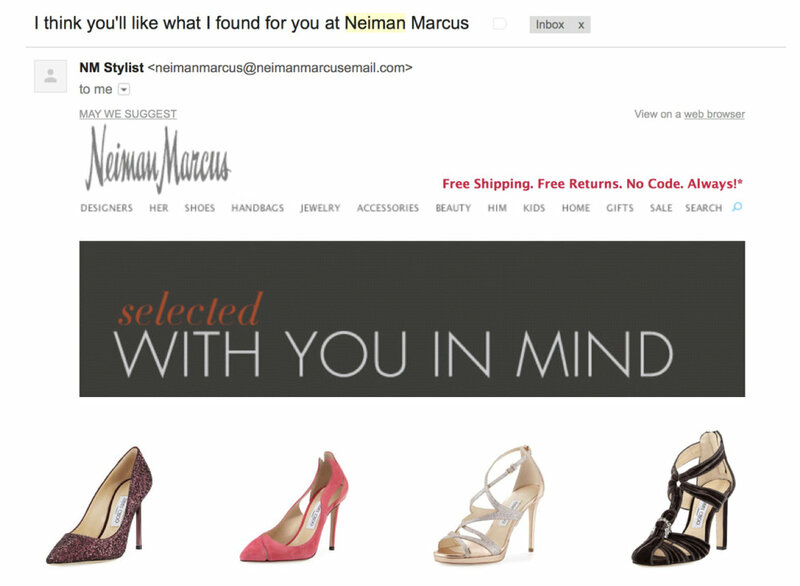 I then received a customized email from Neiman Marcus with a “We Thought You’d like….” message and content recommending a few more pairs of shoes – and it included a purchase incentive (sweet!). Embedded into neimanmarcus.com is a “Just for You” section that featured a few pairs of these beautiful heels. And a few days later I received a direct mailer notifying me of an event at a store near me where new arrivals of Jimmy Choo’s would be featured (to drive me into the store I guess to try them on and seal the deal). Brands like Neiman Marcus use geolocation, web analytics data, clicks, page views and dwell time to make inferences about my behaviors and preferences, and they’ve got it down. They connect with me along different touchpoints as I move throughout my busy life – email, online, direct mail, mobile, in store. They are delivering me relevant, action-oriented and customized content to drive purchase and build loyalty. Maybe even one of these days they’ll convince me to buy from the shelf (or perhaps digital shelf) when I’m feeling a “treat-yourself” day come along. Whatever brand I’m working on, I know that understanding the shopper is a key component and is certainly not a one size fits all. As the modern shopper journey becomes increasingly complex, I’m fascinated at how we are able to engage and influence their shopping decisions along every step. I want to understand their unique demands, mind states and behavior, and deploy a strategic, effective and action-oriented plan that injects technology, brand value, shopper marketing best practices and industry/brand standards. In today’s omnichannel world, I want a brand to deliver me what they know I need, remind me of the things I forgot I should have and delight me with things I didn’t even realize I want. This is how to win me over – after all, I am today’s modern shopper.